I just love making Christmas Cards….How about you? I took advantage of the long Holiday weekend and got some more Christmas cards made. I rarely get a chance to play along with card challenges these days and am thrilled that I found these two to jump start my mojo! I will be linking up with the Sketch over at Viva la Verve and the gorgeous picture you will see below at The Card Concept. Categories: Cards | Tags: Card making, Cards, Christmas cards, rubber stamps, Verve Stamps | Permalink. So very beautiful! What a fantastic layout and you picked the most wonderful papers and embossing folder to make this lovely design. Love your non traditional Christmas colors, they are my favorite. You really rocked these two challenges and I love all of the papers on your card. I see you added some texture as well. Glad you had some time to play and create. Beautiful Christmas card and a great take on the sketch. I love making Christmas cards too. Have a great week my friend. So pretty, I love the colors!!! The pink and green is so soft and pretty, Nancy, and I love all the layers and texture. 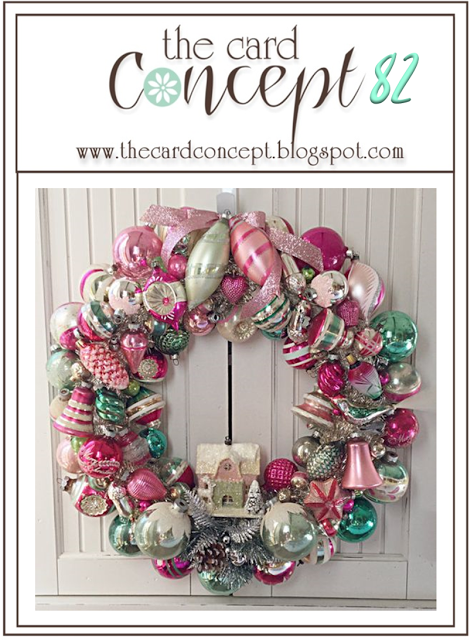 I am loving the luscious layers, the fun colors and that gorgeous wreath! Beautifully done! What a beautiful card and your bright, cheery colors are perfection! Thank you so much for joining us at The Card Concept this week. Please join us again on December 6th for our last challenge of this year! Oh, such a pretty card, Nancy! Love the fun colors and sweet little details on your wreath. So glad you could join us for Viva la Verve!